In the last six months, mortgage rates have taken a sharp turn from the direction they were headed for much of the last two years. After a steady decline, rates shot back up at the beginning of November in 2016, and despite dropping some, they still remain substantially higher than they were at any point in the last two years. However, as rates have gone up, so has online quoting by lenders. 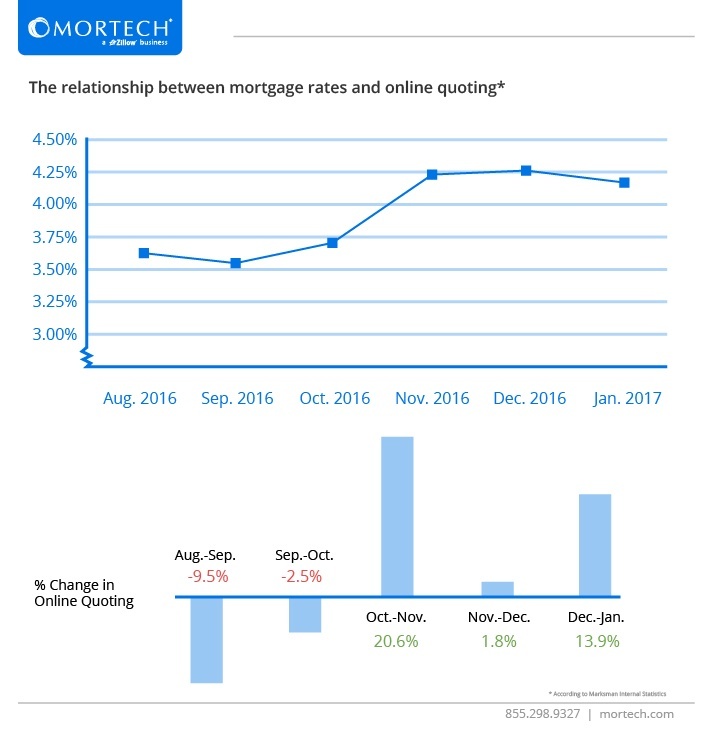 Over the six-month span, as rates began to climb, online quoting and advertising by lenders followed suit. As interest rates rise, and refinances dwindle, online quoting is a great way for lenders to get their brand in front of thousands of potential borrowers on a daily basis. By quoting online to marketplaces like Zillow, Bankrate®, and LendingTree®, you can find more long-term borrower contacts, and reach them with the most accurate depiction of a product you can offer. If the last six months are any indication, rates may not be dropping again any time soon. Are you staying competitive, and getting your rates in front of potential long-term borrowers? Are you providing them with the most accurate and updated rates, and reaching out to them as soon as possible? Mortech has the tools you need to do that and more. Together with Mortech, you can keep filling your pipeline with leads, and also be equipped with the tools you need to distribute and nurture those prospects. To find out more, get in touch with us for a short, free demo, and start using the Mortech advantage.